This winter heating solve your problems by giving style to your home with this striking hanging stove. 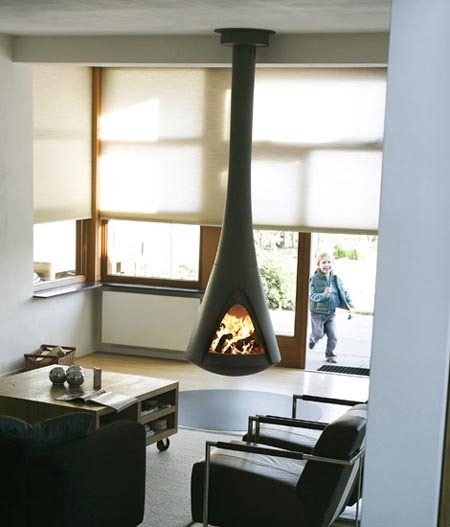 This stove fireplace designed and decorated by Harrie Leenders, has a modern but traditional form is attached to the ceiling, but the original is that it can rotate. 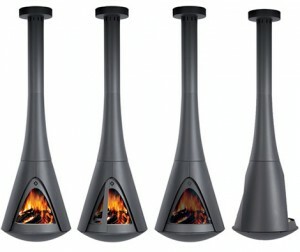 The rotation goes from 60 Ã‚Â° to 360 Ã‚Â°, so you can enjoy an open flame from any angle. The length of the chimney flue can be customized to fit any ceiling height, so if your house has high ceilings or low will be adapted to fit. It also has a security screen to prevent sparks unwanted on the carpet. The living room, dining room or bedroom will look much more inviting and elegant with a stove like this. This entry was posted in DIY, Interior and tagged fireplace design idea, Hanging Fireplace and rotary, Hanging Fireplace and rotary decor idea. Bookmark the permalink.